Extra Bed is chargeable at MYR100++. Book now for stays between now till 31 December 2018! Unlock special member rates by simply ticking the box upon checkout to register as a My Millennium member. Take advantage today! 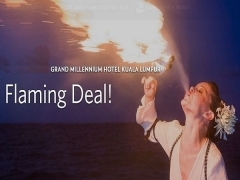 Check out Grand Millennium Hotel Kuala Lumpur for more details about this offer and to book your accommodation now!